We were delighted at the Fairfield Veterinary Centre (not just me as an ardent rabbit lover!) 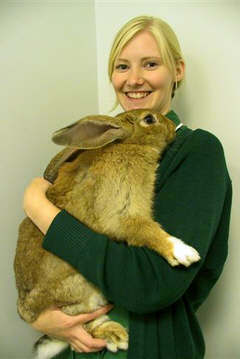 when a Giant Rabbit, weighing 4.5 kg at only 5 months old, was brought to us to be neutered. "Dexter" is extremely well-behaved and his owners have never complained about the typical undesirable sexual habits that occur in both male and female rabbits. He hadn't been circling his owners' feet, grunting and spraying urine or marking his territory by rubbing his chin on different items including his owners' legs and shoes when they return home. Dexter had never shown any signs of aggression that can sometimes be observed in rabbits with very high territorial instincts. Apart from neutering as a method of avoiding behavioural problems there are a number of health considerations. Female rabbits are neutered primarily to avoid the very high incidence of womb (uterine) cancer (70% incidence by the age of 5 years). In Dexter's case castration was performed in order to make him easier to handle as he matures. Handling any rabbit can be tricky; Dexter's size means that easier handling is imperative. Neutering is also useful in allowing him to be paired with another rabbit. . . a female if he's lucky! Despite his enormous proportions Dexter is still subject to the same health concerns as any other type of rabbit. The outbreak of myxomatosis currently sweeping across Leicestershire is still a major risk and his size will be of no help, only vaccination! A high fibre diet and appropriate living conditions are every bit as important in a giant rabbit as in a dwarf rabbit only everything in much larger proportions! The one disappointing aspect to Dexter and his kind is that like giants of other species including dogs they are relatively short lived. Giant rabbits only have an average lifespan of 4years but you can rest assured that Dexter and his owner are certainly going to make the most of that time!